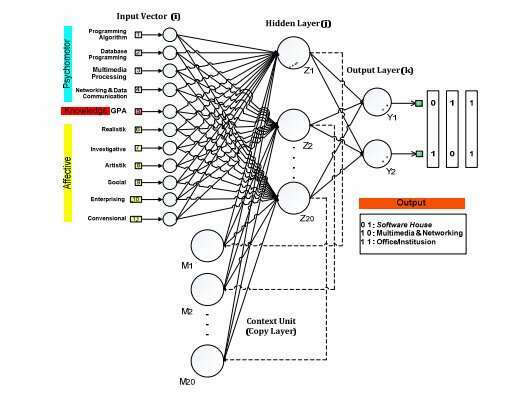 The architecture of the Elman neural network-based system for recommending internship placements. Credit: Permana & Pradnyana. Choosing an internship placement is a key step for many students, as an internship can have a substantial impact on their professional development. Researchers at Universitas Pendidikan Ganesha, in Indonesia, have recently developed an AI-based recommendation system that can allocate students to internship placements that best match their skills and aspirations. After completing their degree, students often struggle to figure out their next step, due to a lack of confidence in their skills or familiarity with the job market. Universities often guide students at the beginning of their career by recommending internship programs that are aligned with their skills and interests. A successful internship placement can play a crucial role in a student's career, helping her to gain confidence and become familiar with the reality of her chosen work environment. On the other hand, a poorly chosen placement can result in the student losing confidence in herself or wasting time in a workplace that is not aligned with her skills. With this in mind, the team of researchers at Universitas Pendidikan Ganesha set out to develop a recommendation system that could assist graduating students in choosing a suitable internship placement. Their system uses a recurrent artificial neural network (ANN) they call the Elman neural network to analyze test results of individual students and determine the placement that best matches their competencies. In this test, the students provide information about their skills, grades, aspirations and interests. The same students also complete a questionnaire called the Inventory Personal Survey, which assesses their attitude and behavior. "Students only need to fill the questionnaire and take the test," the researchers explained in their paper. "The data obtained from the test and questionnaire are then processed by an ANN." The researchers trained and tested their system using information collected from a sample of students who were applying for internships after completing their course. Their evaluations gathered highly promising results, with the system achieving an accuracy level of 95 percent in identifying the internship placements that were ultimately assigned to the students. "Based on the results of our tests, the system can recognize the training data and testing data well," the researchers wrote. "The system can provide recommendations for internship placements, such as software house, multimedia, networking or an administrational job for new students who are seeking internships that match their competencies." The system developed by the researchers could prove very useful at Universitas Pendidikan Ganesha, allowing staff to hand out internship recommendations more quickly and efficiently. To ensure that their technique generalizes well across a larger student population, however, the researchers might need to carry out further studies with a larger training dataset. Until now, their system has primarily been used to provide placement recommendations for informatics students, but it could potentially be extended to other fields of studies. In the future, other research groups might also draw inspiration from this study and develop similar recommendations systems for other institutions.